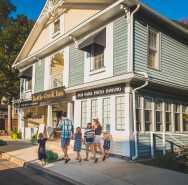 There's no better place to be than the Kettle Creek Inn and the truly friendly village of Port Stanley. The choices are unlimited - induldge in a spa treatment, in-room massage, a yoga class, or maybe a musical at our local theatre... or perfect the art of doing nothing. Package includes a rose, chocolate covered strawberries and wine on arrival; accommodation.Stay 2 nights - be rewarded with a 30% accommodation discount on the 2nd night.